NEW CATEGORY = TEXTILES at Linear B, Knossos & Mycenae! Since this category is in CAPS, it is a MAJOR category. We shall soon be adding another new MAJOR category = VESSELS (i.e. Pottery). In passing, I would like to draw to your attention that the best way to search our research site is to search by category. This way, you can zero in on the posts on the subject which interests you at the moment. 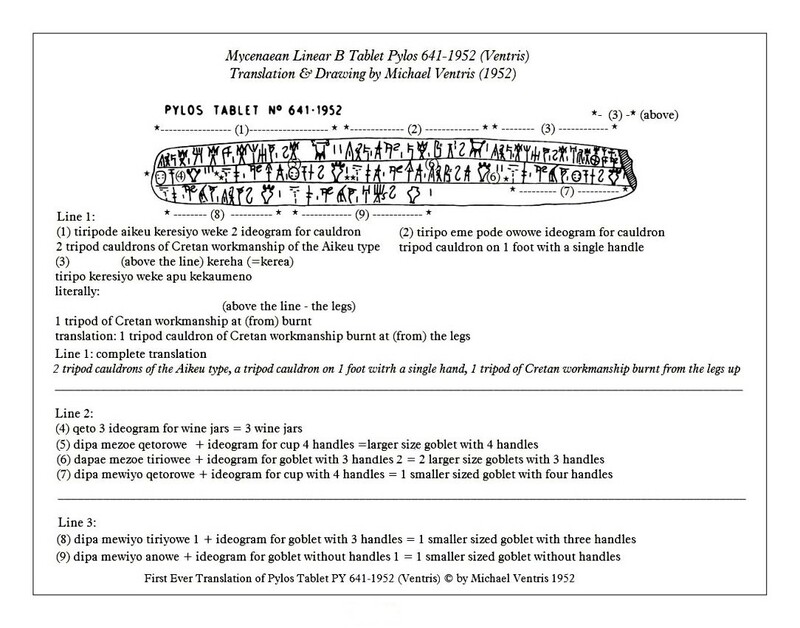 For instance, if you click on Linear A, you will be taken to the pages where all posts on Minoan Linear A appear; if you click on Decipherment, you will be routed to the pages on which all posts dealing with decipherment of any tablet in any script, Minoan Linear A, Mycenaean Linear B or Arcado-Cypriot Linear B appear. And so on. RIGHT CLICK to enlarge the photo to its full size. Then click on VIEW and then SAVE it to your computer. Here you see Shadow, my long-haired tabby, age 5, our mascot on Linear B, Knossos and Mycenae, keeping TABs (get it?) on my keyboard, to safeguard our posts and the security of our site. You can hit the TAB key to see more of her. Just kidding. 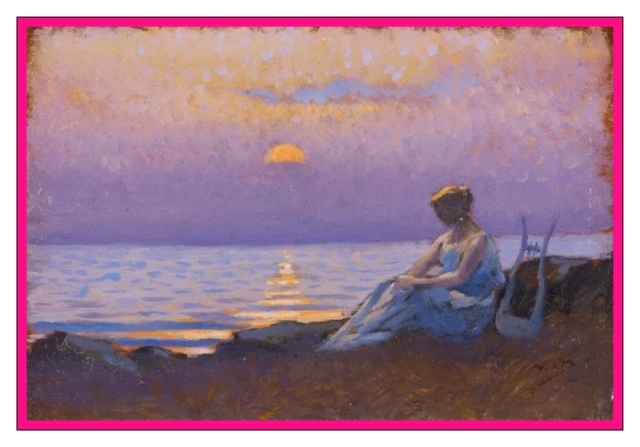 Followers of KONOSO: 1,008: Click the banner to visit our Twitter account, and sign up too, if you like! That gives us 1,694 followers all told. Not bad at all, for topics as esoteric as Mycenaen civilization and Mycenaean Linear B! Part B: a breakthrough in the decipherment of Minoan Linear A? 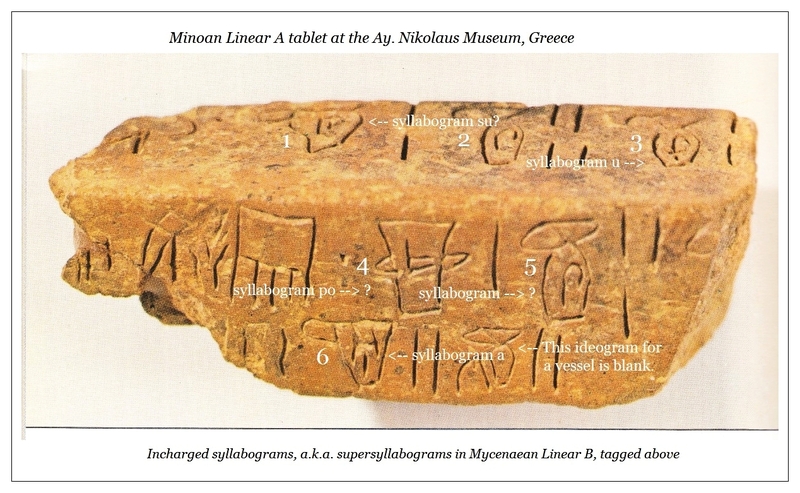 An introduction to supersyllabograms in the pottery and vessels sector of the Minoan-Mycenaean economy and the implications of their application to Linear A tablets for the earlier Minoan economy. 5  of them, as we have already noted in the previous post. Some have surmised that the Minoan language may conceivably be an ancient “rogue” language, but I for one find that assumption a little hard to swallow. Of course, in 1952-1953 Michael Ventris finally proved Evans wrong about Linear B. But in retrospect, who can blame Evans for that, in view of the understandable utter lack of evidence to the contrary in his day and age. Anyway, there were (and still are) no extant tablets in either Minoan Linear A or Mycenaean Linear B with parallel text in another known ancient language, as had conveniently been the case with the Rosetta Stone, to come to the rescue towards convincing decipherment of the latter script, if not the former. In spite of this untoward situation, the latter, Linear B, was effectively deciphered by the genius Michael Ventris (1922-1956) in July 1952. 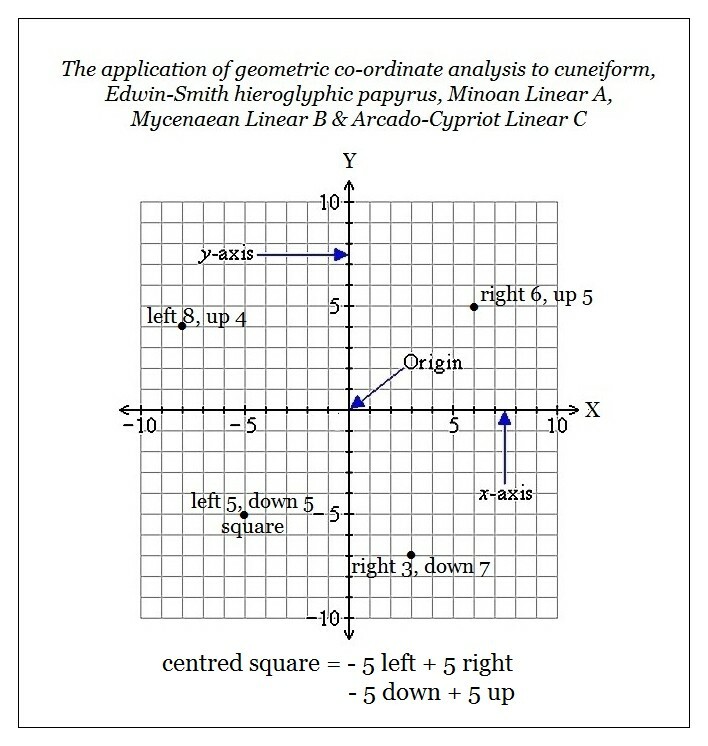 Moving on then, any word which either precedes immediately or is nearly adjacent to any particular ideogram  in Minoan Linear A may in fact be the actual word corresponding to that ideogram, just as Michael Ventris firmly demonstrated it is in his translation of Pylos tablet 641-1952 (Ventris) in Mycenaean Linear B. So it stands to reason that the translation for a similarly situated word in Minoan Linear A which is (nearly) adjacent to its ideogram is, in fact, the very word the closely situated ideogram pictorially represents. 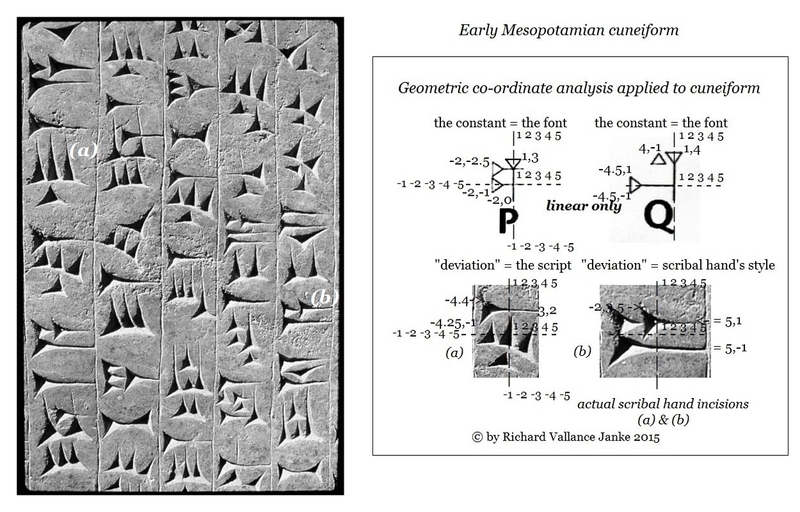 If this notion seems far-fetched, let us stop for a moment to consider whether or not there is any relationship between such a phenomenon, should it exist, in Minoan Linear A and the actual one corresponding to it in Mycenaean Linear B. It just so happens that not only does a strikingly similar construct exist in Linear B, but that it is found on not scores, but hundreds of extant Linear B tablets (in the range of 725 all told from Knossos and Pylos, of which 700 are from Knossos alone). Now what I am proposing is a cross-correlation  between the unknown meanings of at least a few Minoan words paired with the ideograms with which they are associated and the indisputably known values (meanings) of several Mycenaean words paired with strikingly similar if not identical ideograms in Linear B. In other words, we may very well have at hand an independent variable  in a deciphered ancient language against which we can compare at least a very few Minoan words, and that language is Mycenaean Linear B. Let us say that the latter acts as a sort of Rosetta Stone, in which deciphered words adjacent to ideograms act as a litmus test for (apparently) equivalent lexemes in Minoan Linear A. 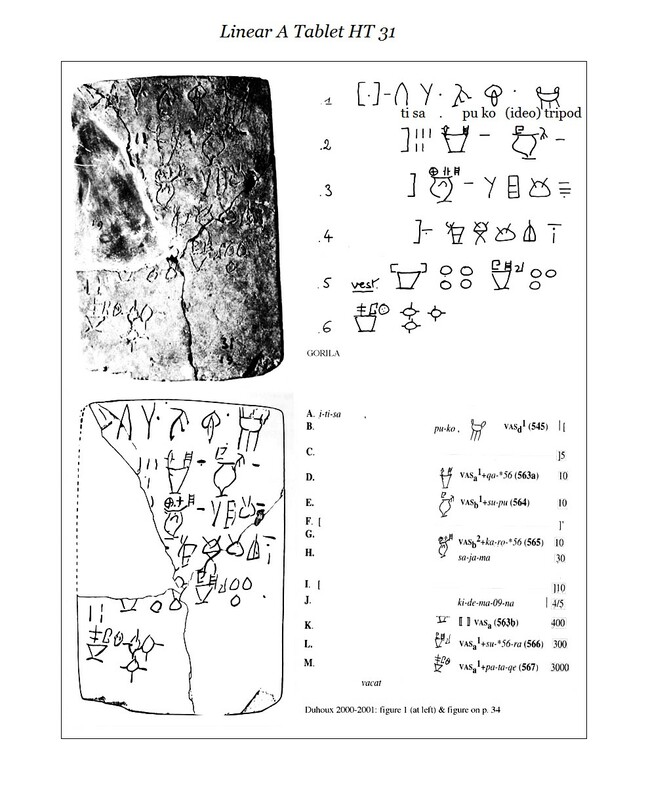 Her much more recent translation (2015) is so accurate from a strictly archaeological  perspective that it serves an an ideal benchmark for the partial decipherment of at least a few of the words and the so-called incharged supersyllabograms representative of 5  of them on the Linear A tablet from the Ay Nikolaus Museum, Greece. 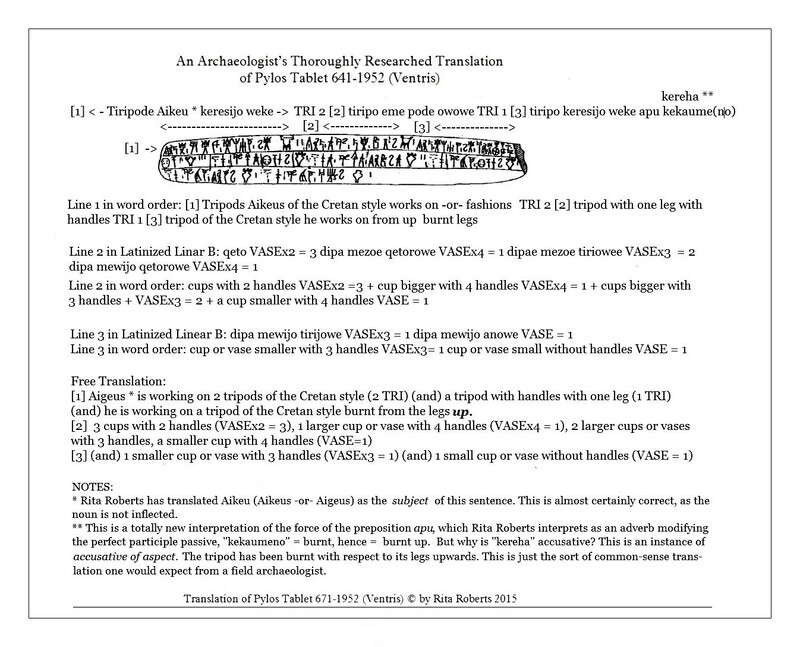 Yet before we can tackle a fragmentary decipherment of  these vessel types in Linear A, we first need to address (a) the pairing of translated words for 5  types of vessels on Pylos tablet TA 641-1952 (Ventris) as specifically and accurately identified by Rita Roberts, and (b) the even more significant phenomenon of what I refer to as supersyllabograms paired with ideograms on this and other extant tablets in the pottery and vessels sector of the Mycenaean economy, if we are to make any headway at all. 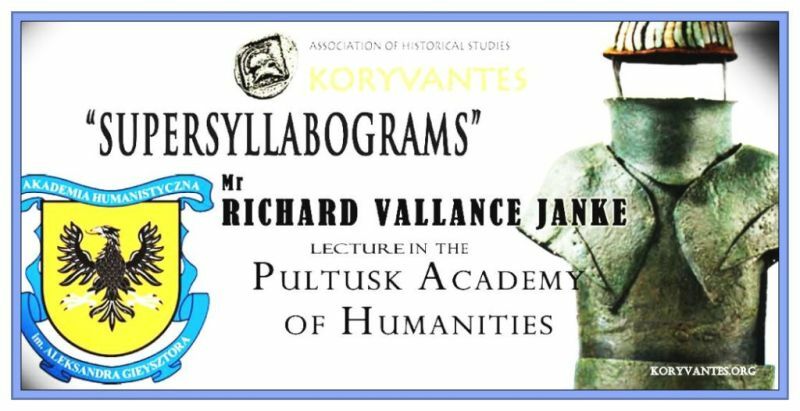 We must take particular note of the extremely precise translations she makes of all of the types of vessels found on Pylos TA 641-1952. These are, respectively, tripod   (the most significant of them all, as we shall soon enough discover when we come to Minoan Linear A tablet HT 31, 2 and 3 handled kylixes ,  the 24 and 32 handled pithoi   for the storage of olive oil or wine, and dipae (anowe) ,  small drinking cups, with (or without) handles. We need to to bear all of these vessel types firmly in mind, as they are going to make a cameo appearance in our attempt at the decipherment of at least a few types of vessels in Minoan Linear A infra  (the next post). 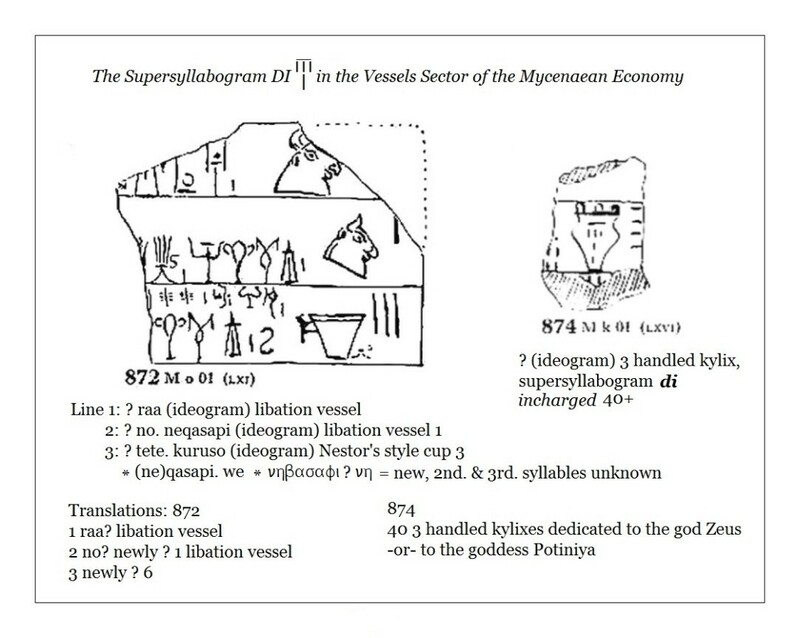 To recap a topic which I have addressed over and over on our blog, Linear B, Knossos and Mycenae, I advance the following definition of the phenomenon known as the supersyllabogram in Mycenaean Linear B. By default and without exception, supersyllabograms are the first syllabogram, in other words, the first syllable of one Mycenaean Linear B word or phrase in particular and no other, which is always solely dependent on the specific context of the economic sector of the Minoan-Mycenaean economy in which it appears. Change the context of the economic sector, for instance from the agricultural to the military or the vessels sector, and you automatically change the significance of the supersyllabogram, with very few exceptions, the most notable being the syllabogram ne , invariably meaning newo   (masc. ), newa   (fem.) or “new” in all sectors. This clear-cut definition makes so much sense there is little or no reason to contest it. 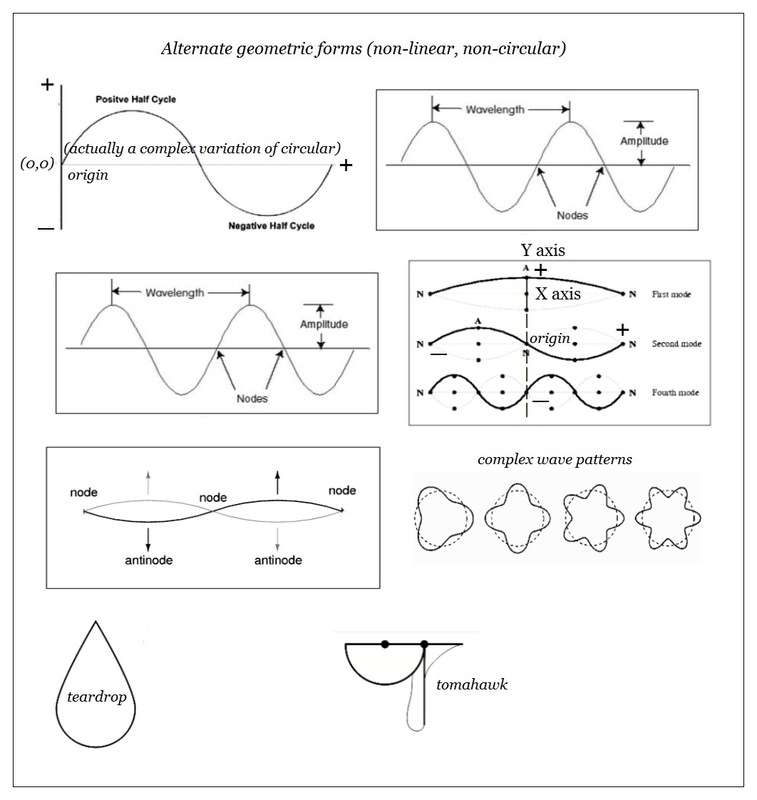 Moreover, all such single syllabograms, a.k.a. supersyllabograms, without exception, appear either (a) adjacent to or (b) inside the ideogram they qualify, and (c) they are repeated over and over, like clockwork, on hundreds of tablets in almost every major sector of the Minoan/Mycenaean economy, by which I mean, the agricultural and its sub-sectors (livestock of all sorts and primary crops), the military, the household, the vessels and pottery and the religious sectors. Supersyllabograms appearing adjacent to their ideograms are invariably associative  , while those bound inside their ideograms are invariably attributive. Associative supersyllabograms, which are found in droves in the agricultural sector of the Minoan-Mycenaean economy, are either surcharged ,  adjacent to the top right or  occasionally to the top left, or supercharged  ,  situated right on top of the ideogram they qualify. Unfortunately, the scope of our present investigation does not leave us any room to focus on the equally significant phenomenon of associative supersyllabograms which are found on some 700  of 3,500  or fully 20 %  of extant tablets from Knossos alone! This we must leave until later on, since they too call for in-depth analysis of them in all sectors of the Minoan-Mycenaean economy, but most notably in the agricultural sub-sector livestock, especially where sheep (rams & ewes) are concerned, to which they apply on 90 %  of all tablets in that sector. Attributive supersyllabograms are invariably incharged , bound inside the ideogram they qualify. It is these we are concerned with here, as they are eminently characteristic of the pottery and vessels sector of the Minoan-Mycenaean economy, the very sector with which we are dealing, as we address their critical rôle in Mycenaean Linear B and Minoan Linear A, in which they apparently also appear, taking the tablet we addressed in the last post as our example. Here, two supersyllabograms in particular call for clarification. The fist of these is ka , to which I have assigned four (4) possible variants. The most obvious of these is the first, kako or kakeyapi = copper. 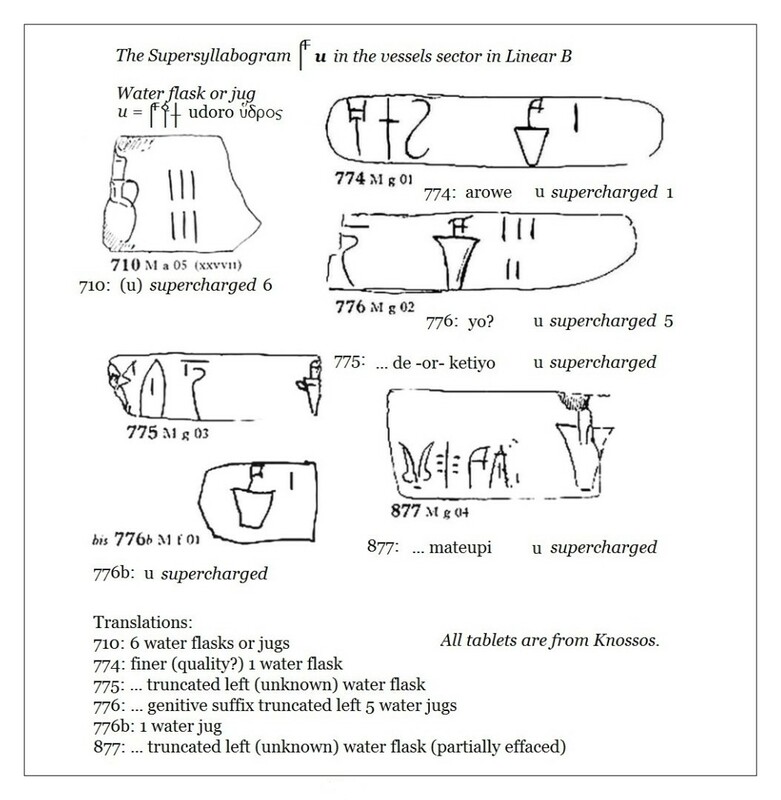 This SSYL (supersyllabogram) ka  might also possibly refer to kapo = fruit, hence, to a fruit jar, or to a stirrup jar, sometimes referred to as kararewe in Linear B or even to kati, a kind of (water) vessel or flask. Since the last under consideration here obviously overlaps with the incharged SSYL u,  which clearly designates a water jug, flask or flagon, I have no choice but to dispense with that meaning. While the vessel could be of copper, it is just as likely that the scribes were referring to the stirrup jar. Of the latter two explanations, the last strikes me as the most convincing. Next we have the SSYL po , which could refer to any of the following: posedao(ne) -or- (ni) = Posedaon i.e. Poseidon (god’s name) or to posidaewe, related to a cult apparently associated with Poseidon, potiniyaweya (adjectival/attributive), referring to the priestess or follower of the Minoan-Mycenaean/Homeric goddess, Potnia, to porenaya, attendants in sacrificial ceremonies, to porupode, an octopus, generally on a vase or amphora, to ponike, decorated with a griffin or ponikeya, crimson, and finally, to popureya, purple. Since we are confronted yet again with the conundrum, what did the scribes themselves intend the SSYL po   to signify, I felt obliged to account for all of these variants. Yet in light of the research literature on religious and sacrificial rites in the Minoan and Mycenaean societies, it strikes me that the most tenable translation or the SSYL po   is the adjectival attribute potiniyaweya, referring to a priestess or follower of the Minoan-Mycenaean/Homeric goddess, Potnia, since only only was their religion eminently matriarchal, but also this goddess in particular is frequently mentioned on extant tablets. Now because we were not there when the scribes so often resorted to employing these supersyllabograms, we cannot ever really know what the SSYL po   or others like it resistant to interpretation meant to them. They certainly knew, and as a guild, they invariably assigned one meaning and one only to each supersyllabogram they deployed on the Linear B tablets. The supersyllabograms are therefore all standardized and all formulaic . No variations were countenanced. Not that they ever cared one jot whether or not any one would understand their meaning in the future, since after all they were accountants, and accounts are by definition ephemeral. The extant inventory tablets from Knossos, Pylos and elsewhere only survive due to massive conflagration or other preservative factors at each archaeological site. 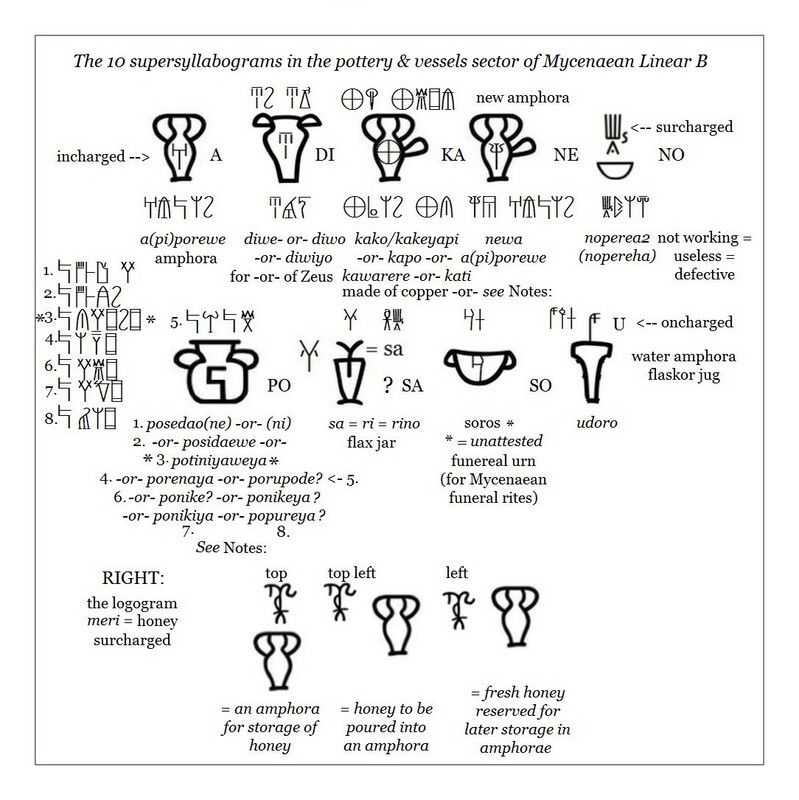 But we still owe it to ourselves to make every effort to reconstitute a few variants on putative meanings assigned to each supersyllabogram which remains ambiguous, otherwise we learn nothing new of further value in the field of archaeological linguistics in either Mycenaean Linear B or Minoan Linear A.
Supersyllabograms (SSYLS) in Mycenaean Linear B are so information rich that they call for further clarification. 2. My translations of even these few tablets alone reveals this astonishing finding: supersyllabograms replace not only single words but often entire phrases in Mycenaean Linear B. 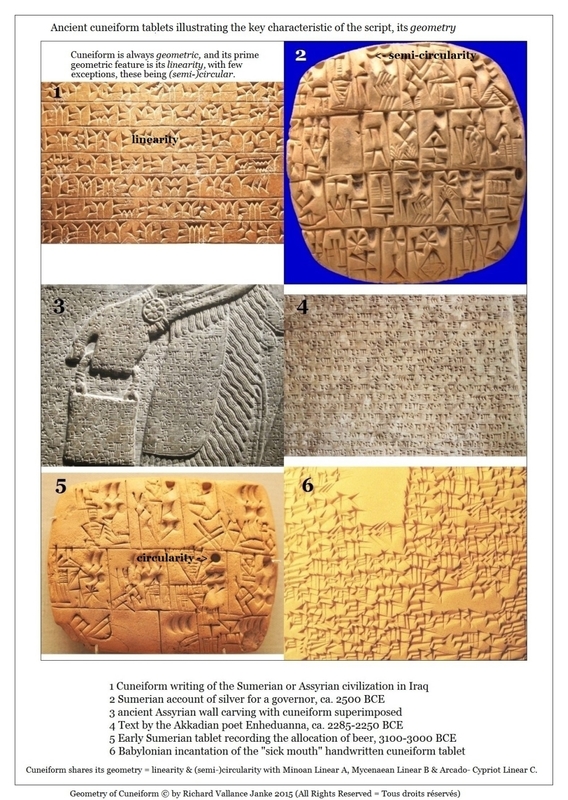 Effectively, they telescope what would have otherwise been discursive and space-wasting text on what are ostensibly small tablets in Linear B (ranging from 15 cm. wide to a maximum of 60 cm. by 60 cm deep), into a single discrete element, namely, themselves. 3. This reveals another prime characteristic of Linear B tablets deploying supersyllabograms as replacements or stand-in markers, i.e. 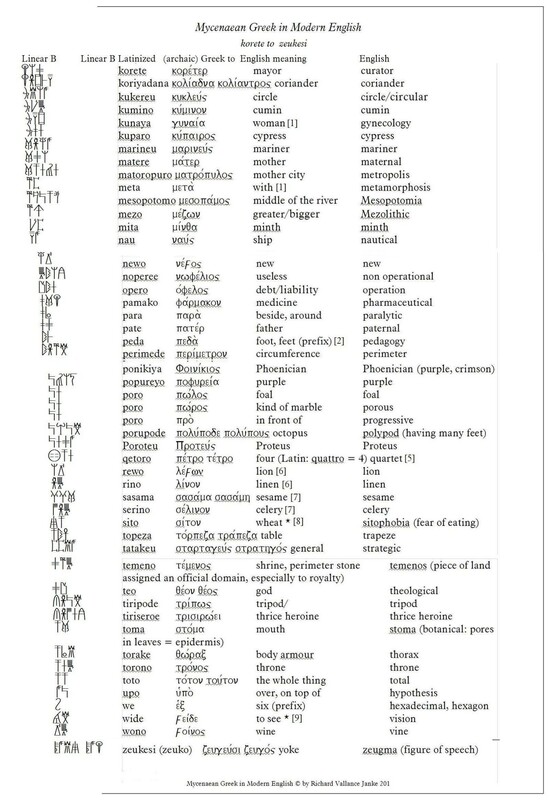 subject headings, for Mycenaean words or phrases. Supersyllabograms in the pottery and vessels sector alone (as in every other sector of the Minoan-Mycenaean economy) boil down to being shorthand . 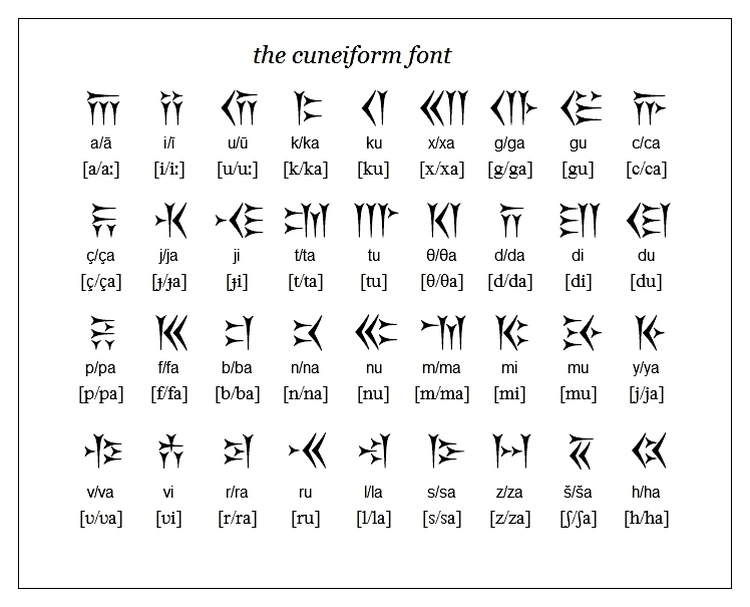 This discovery sets back the time frame for the first known use of shorthand some 3,300 years from the late nineteenth and early twentieth centuries, when it was previously assumed shorthand originated. In this respect alone Mycenaean Linear B attains a high degree of versatility and sophistication virtually unknown to any other contemporaneous script, hieroglyphic or syllabogrammatic, inclusive of Linear C, which abandoned ideograms altogether as the very last step in the evolution from the pre-alphabetic syllabaries (Minoan Linear A, Mycenaean Linear B and Arado-Cypriot Linear C) into the earliest known forms of the ancient Greek alphabet. 4. Above all other considerations, the majority of supersyllabograms in Linear B in the pottery and vessels sector of the Minoan-Mycenaean economy are attributive, dependent on the ideograms they qualify. Attributive dependent supersyllabograms are never adjacent to the ideogram they qualify, but are always bound inside it. Without exception, they describe an actual attribute of the ideogram. For instance, as we can see from the table of the 10  supersyllabograms in the pottery and vessels sector of the Minoan-Mycenaean economy, the syllabogram a  inside the ideogram for a vessel with 2 handles is the first syllabogram, i.e. the first syllable of the Mycenaean word apiporewe, clearly identifying the vessel as an amphora. But why even bother tagging vessel as an amphora, when it is obvious that the ideogram in question looks so remarkably like an amphora in the first place? Recall that the Mycenaean scribes never used any linguistic device without a reason. In this case, the reason, I believe, is that the scribe deliberately inserts the syllabogram  a  inside the ideogram for what is probably an amphora anyway to call our attention to the fact that this vessel in particular is an extremely valuable, more than likely ornate specialty amphora intended for the Minoan or Mycenaean nobility in any one of the major palace complexes. I can see no other reason why any Mycenaean scribe would resort to such a tactic other than to identify it as a precious commodity. Likewise, the simplified, streamlined syllabogram sa  (stripped of its small arms at 90 degrees to its Y arm) incharged   in the ideogram for a vessel is almost certainly the supersyllabogram for an unknown pre-Greek, probable Minoan word beginning with the syllabogram sa   (a distinct clue in and of itself) for raw flax, the agricultural crop the Mycenaeans Greeks called rino = flax (as an unrefined agricultural crop) or the refined product, linen cloth. Both of these supersyllabograms are incharged,  in other words, attributive,  as can clearly be deduced from their significance noted here. Although we can readily cite further examples from the table illustrative of the 10 supersyllabograms in the pottery and vessels sector of the Minoan-Mycenaean economy, I must leave that analysis for another time and place. However, it is worthwhile noting that I have discovered, isolated and classified some twenty-five (25) attributive supersyllabograms alone (exclusive of associative) in all sectors of the Minoan-Mycenaean economy to date. That is a very great deal from a syllabary consisting of 61  syllabograms all told. The phenomenon of ambiguity in the meaning of certain syllabograms incharged or surcharged to their ideograms in Mycenaean Linear B is a really nasty stickler in the interpretation of incharged supersyllabograms (if that is what they actually are) on extant tablets in Linear A in the Minoan language, which has stubbornly resisted all attempts at decipherment to date. Any attempt to decipher incharged supersyllabograms in Minoan Linear A amounts to a daring plunge into an unknown sea. But I for one love to dive, and I swim well enough to take the plunge. Now it just so happens that everything we have just noted about supersyllabograms in the pottery and vessels sector in Mycenaean Linear B may indeed apply just as well to the same sector in the earlier Minoan economy. This we shall demonstrate in the next post.